Put those little grey cells to work with the Agatha Christie quiz. This page will include a regularly updated quiz consisting of 10 questions, some of which are considerably harder than others. I intend to publish the answers in the All About Agatha Christie Newsletter. 1. What is the name of Poirot’s manservant? 2. Who is the first person to be killed on the island in ‘And Then There Were None? 3. In which novel do we encounter Mrs Sweeetiman and Bessie Burch? 5. What did the maid Gladys Martin have on her nose when she was found murdered? 6. What is the profession of Carlotta Adams? 7. What method of murder was used to kill Amyas Crale? 8. In which novel does Captain Hastings meet his future wife? 9. Whose sister is Mrs Hubbard? 10. Which hotel do Molly and Tim Kendal run? If you know somebody who'd like to have a go at this Agatha Christie quiz just click on the link below. In the Tell A Friend box that appears just enter your name, e-mail address, their e-mail address(es) and any comments you'd like to add. Then just hit the Tell A Friend button. Your friend(s) will be sent your message along with a direct link to this quiz page. 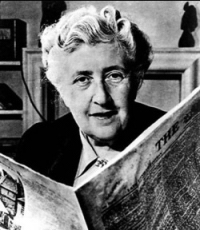 If you can't wait until the answers are published in the All About Agatha Christie Newsletter, please feel free to get in touch via the contact me form - see menu to left - and I'll send you the answers straight away.